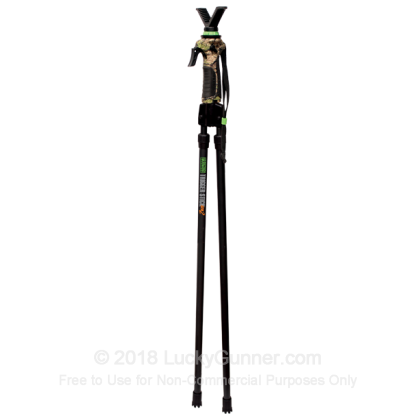 Height - 24" to 61"
This versatile bipod features a trigger-based quick adjustment system that makes it adaptable to a variety of conditions. An ideal rest for shooting in kneeling or standing positions, it also accepts 1/4"-20 and 3/8"-16 threaded devices such as rangefinders, cameras, spotting scopes, and other optics. The removable V-yoke gives 360 degrees of rotation with unparalleled ease. For maximum convenience, the Primos Trigger Stick uses strong 7075 aluminum legs that telescope quickly and quietly. It can adjust from 24 inches to 61 inches to accomodate various users and desired functions. At just under 2.4 pounds, it's light enough to carry around for extended periods without weighing the user down.